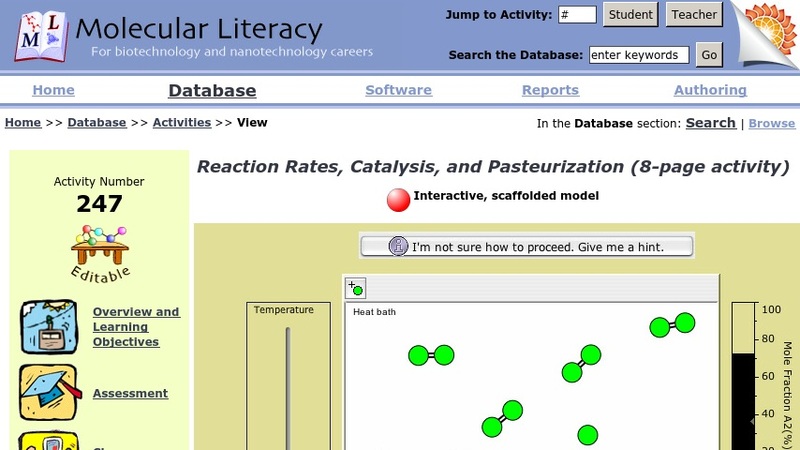 In this activity, by the Concord Consortium's Molecular Literacy project, students are introduced to "key ideas of chemistry, including reaction rates, bond strength, activation energy, catalysis, and equilibrium." Upon completion of this activity students should be able to describe and manipulate models to discover how reaction rates, energy, bond strength, catalysis, and equilibrium are related; manipulate reaction rates by changing temperature and concentration; demonstrate their understanding by creating an endothermic reaction that releases a lot of heat energy, one that requires a catalyst, and one that reaches equilibrium between reactants and products. The activity itself is a java-based interactive resource built upon the free, open source Molecular Workbench software. In the activity, students are allowed to explore at their own pace in a digital environment full of demonstrations, illustrations, and models they can manipulate. In addition to the activity, visitors will find an overview of the activity, a test and rubric, central concepts, and their correlation to AAAS standards.